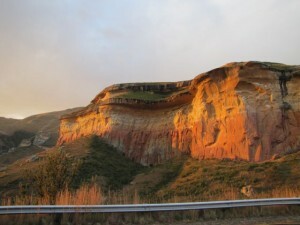 Clarens is well known for the many hiking trails available in the area – ranging from short easy trails, ideal for an evening stroll with the family, to longer or more demanding trails for those looking to get some exercise or simply spend some time in the fresh air. The trails are well marked and easily accessible from town. There is no entry charge for hikers, but mountain bikers must get biking permits – available from Clarens Xtreme at 530 Sias Oosthuizen Street. The trails are well marked and maps of the trails are available from Bibliophile, Protea Hotel, Mountain Odyssey, Old Stone Bottle Store, Maluti Footprints and The Gallery On The Square. Scilla Walk (easy 2.4 km): The name is derived from the blue-flowering Scilla (Merwilla plumbea), a protected species found in parts of the nature reserve. Maluti View: (700m) This trail is perfect for a late afternoon stroll and overlooks the Maluti Mountan Range. Ideal vantage point to watch the sun set. Kloof Mountain Trail (moderate: 3.4km) There is some initial climbing but the path across the summit is relatively easy, whilst the lower contour path is slightly more challenging. Stunning views. Kloof Dam Walk (easy: 1,2 km) The Kloof Dam is a popular fishing and swimming spot for locals. This easy walk continues past the dam to the Kloof where there is a pretty waterfall in summer. Leucosidea Trail (easy: 2.2km) An easy walk past the Kloof dam and surrounds. An abundance of spring and summer flowering plants occur in this area. Mallen Walk (moderately easy: 1,1km) The Mallen walk involves some initial climbing followed by an almost level contour path. Recommended walk for day visitors. The trail joins both the Kloof Mountain Trail and the Spruit walk, making for easy further exploration. Spruit Walk (easy: 2,5km) This popular walk follows the Clarens spruit through ouhout scrub forest, Lombardy poplar and cypress plantations all the way to the Kloof dam. Porcupine Trail (easy: 3.5km) A looping trail which connects the Leucosidea and Kloof Mountain Trails. Enjoy sandstone outcrops and overhangs, open grassland and a wide variety of birdlife. Titanic Walk (moderate: 2km) An easy walk until you get to the final climb – which is not recommended for inexperienced hikers. Good views of Titanic and the surrounding area. Caracal Contour (5.2km) The vistas are simply stunning. These trails are maintained by The Clarens Village Conservancy. There is a hiking trail that starts right in the Estate and leads up to Smiley Face, which- as the name may suggest- is a large smiley face painted on the side of Mount Horeb by an anonymous artist. From Smiley Face, another hiking trail leads up to the the summit of Mount Horeb. At the top of Mount Horeb, there is a Trig Beacon and visitors book. The magnificent view includes: Fouriesburg, Clarens, and vast parts of the Golden Gate Highlands National Park. For those who love to explore, St Fort offers four expertly laid out hiking trails. Choice of various hikes ranging from a 45 minute walk to the 2 day Rhebok Hiking Trail. Collect your hiking map at the Glen Reenen Reception area before you set off. We also recommend you visit The Solitary Ecologist website for full details, maps, and stunning photographs of the trails. Cathedral Cave Hike : Duration 4 Hours Guided Hike with a low difficulty grading. Booking essential. 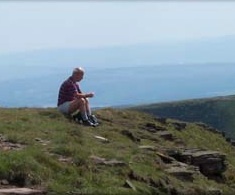 Wodehouse Hike: Duration ± 4 Hours Unguided Hike with a high degree of difficulty. Click here for map (.kml file), gradients, and photographs from The Solitary Ecologist. Mushroom Rock Hike : Duration ± 1 Hr. Unguided hike with a low level of difficulty. Suitable for young children. Click here for map (.kml file), gradients, and photographs from The Solitary Ecologist. Echo-Ravine Hike: Duration ± 1 Hr. Unguided with a medium level of difficulty. Suitable for Children. Click here for map (.kml file), gradients, and photographs from The Solitary Ecologist. Boskloof Hike: Duration ± 1 Hr. Unguided with a medium level of difficulty. Click here for map (.klm file), gradients and photographs from The Solitary Ecologist. Holkrans Hike: Duration ± 1 Hr. Unguided Hike with an easy to medium level of difficulty. Click here for map (.klm file), gradients and photographs from The Solitary Ecologist. Brandwag Rock Hike: Duration ± 1 Hr. Unguided loop hike, suitable for accompanied children with medium degree of difficulty. This hike has a chain to help with a steep accent. Click here for map (.klm file), gradients and photographs from The Solitary Ecologist. stove. Bring your own cooking facilities, food, utensils and sleeping bags.Distance: 31 km Booking is essential: To book phone: (058) 255 0951. This hike has a chain to help with a steep accent. Click here for map (.klm file), gradients and photographs from The Solitary Ecologist. Matlakeng Herbal Trail – The trail starts at 9h00 The Basotho Cultural Village. An ngaka (traditional healer) escorts groups on a scenic 2 hour trail, all the while locating an array of grasses, roots, herbs, leaves and bark and explaining how these are prepared and used to cure ailments from toothache to sexually transmitted diseases, as well as their ritual uses in Basutho Culture. 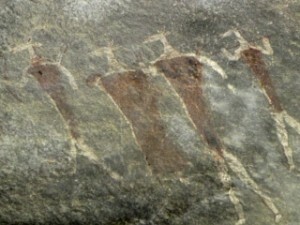 Hikers can also expect to see wild-life, and also some well-kept rock art. The herb trail is only open on Tuesdays, Wednesdays and Thursdays, during the Spring and Summer months, and must be booked 2 days in advance. Stand at over 3000 meters above sea level and take in the view. The day hike (13km) starts at the Witsieshoek car park (Qua Qua). (Be warned, the last section of road from Phuthaditjhaba to the Witsieshoek Sentinel carpark is very rough) and takes you to the edge of the Amphitheatre via two chain ladders, to the Tugela waterfall. Hikers must be sure that they are well prepared for all weather conditions before starting off: the weather can change extremely quickly and one can go from full sunshine to misty conditions and even snow in a matter of minutes.